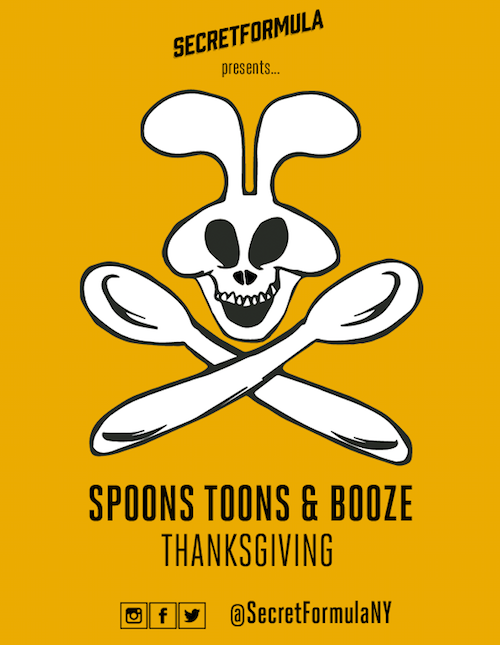 Your Favorite Saturday Morning Cartoons + Booze & Free Cereal plus a Special Menu of Thanksgiving Themed Episodes! We’ve got all your favorite Saturday morning cartoons, delicious cocktails and a free all you can eat sugar cereal bar, not to mention Nitehawk Cinema’s excellent brunch menu. Hosted by SecretFormula’s Michael Austin and Nell Casey. Tickets for this event are non-refundable and cannot be exchanged for another date. – A special menu of Thanksgiving themed episodes filled with Turkeys, Pilgrims & Native Americans, Macy’s Thanksgiving Day Parades, football and overeating! – Specialty cocktails like The Complete Breakfast with Cinnamon Toast Crunch infused rum, Bailey’s Irish Cream and iced coffee; and “The Sonny,” a White Russian topped with Cocoa Puffs! – Cereal Shots! Drop a shot of Baileys or Kahlua to booze up your cereal bowl! – Compete in contests to choose which cartoons we watch and win cartoon- and cereal-themed prizes plus tickets to Nitehawk Cinema!